Want an easy breakfast the whole family will enjoy? 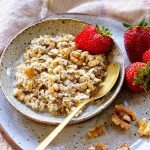 Definitely consider easy overnight oats - super simple, incredibly delicious and so good for you too! Split the oatmeal between two bowls stir and add 1/2 cup of milk to each bowl. Cover it and refrigerate overnight. In the morning, slice and chop your favorite fruit. Top the oatmeal with granola, chopped nuts and/or a spoonful of chia seeds and serve. It's really that easy!